Our season once again opened with the South Downs Way 50 and what a spectacular opener it was. In the lead up to this sixth edition of the event, conditions on the Downs had been poor, as they had across the UK for much of the winter. Sitting water and mud were features up and down the course. But two dry, bright and windy days on the Thursday and Friday before race start Saturday morning, were enough to dry the chalk downland out almost completely. Suddenly the course was as good and fast as ever, presenting this years runners with close to ideal underfoot conditions. 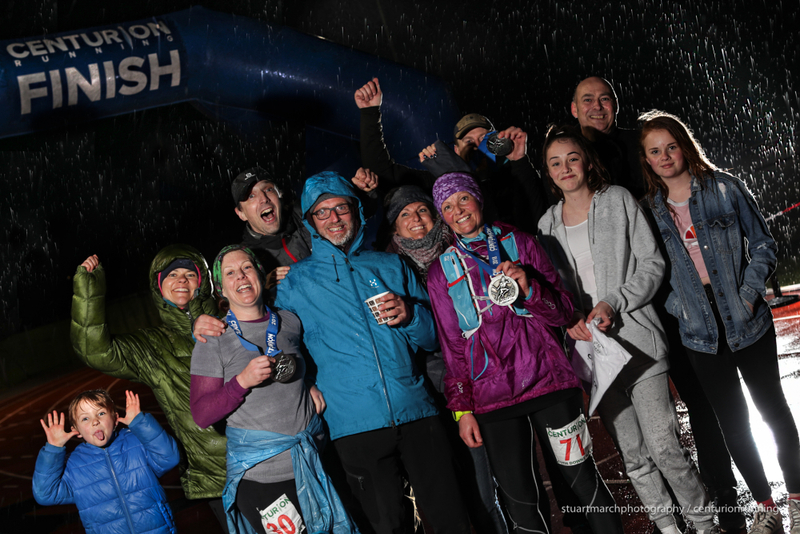 To add to that, the rain that was forecast for across the 13 hours of the race didn't materialise until later on and many were able to enjoy a predominantly or entirely bright, clear day with stunning views in all directions. This year we welcomed 389 runners to the start in Worthing. Two stand out athletes amongst them, both en route to representing Team GB at the upcoming 2018 World Trail Championships. 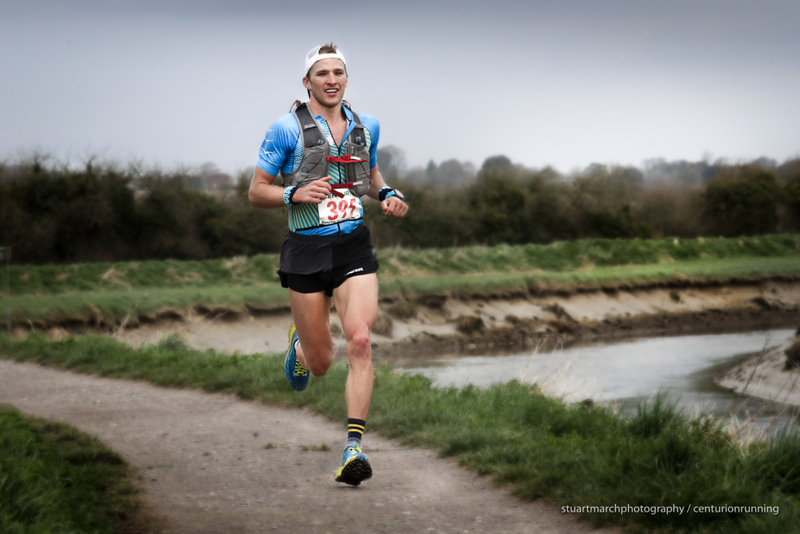 Tom Evans in the mens race has become arguably the UK's leading ultra distance trail athlete over the last 18 months with Top 5 finishes at the MDS, Eiger 101 and CCC behind him. 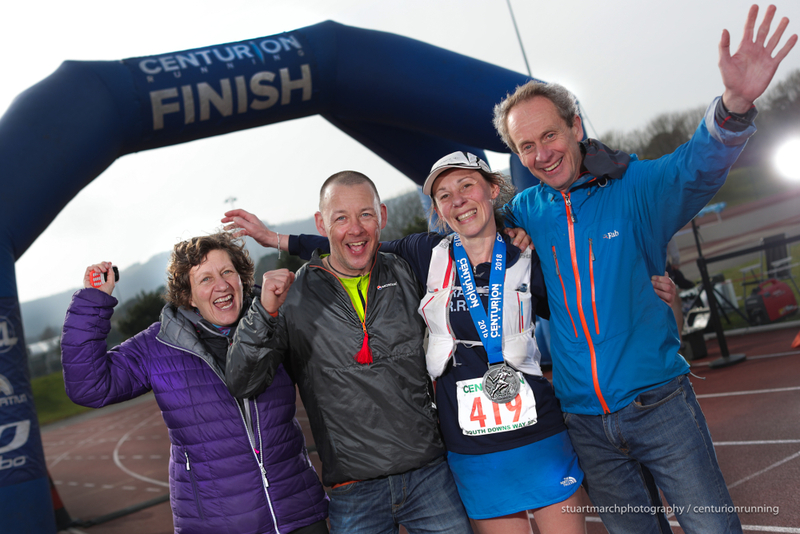 In the womens race, Sarah Morwood was looking to add to her six previous Centurion crowns. From the gun it was those two runners who showed their true class and ran home with tremendous course records. Tom led off the field and much like Victor Mound in 2015 when he ran a seemingly untouchable 5:53, time trialled the entire way to the finish. Appearing at Botolphs check point 11.2 miles in to the race and with 1:13 elapsed he was under record pace from the start. His long flowing stride and easy breathing belied the fact that he was averaging 6:30 minute mile pace. He didn't stop at Saddlescombe Farm, nor at Housedean which marks the 26.6 mile point and which he reached in 3:01 elapsed. In to Southease at mile 33.8 in 3:52 he made his one and only pause for any official aid, taking on one additional flask of water and he admitted later he was feeling lower at that point and was very pleased to get some hydration on there. 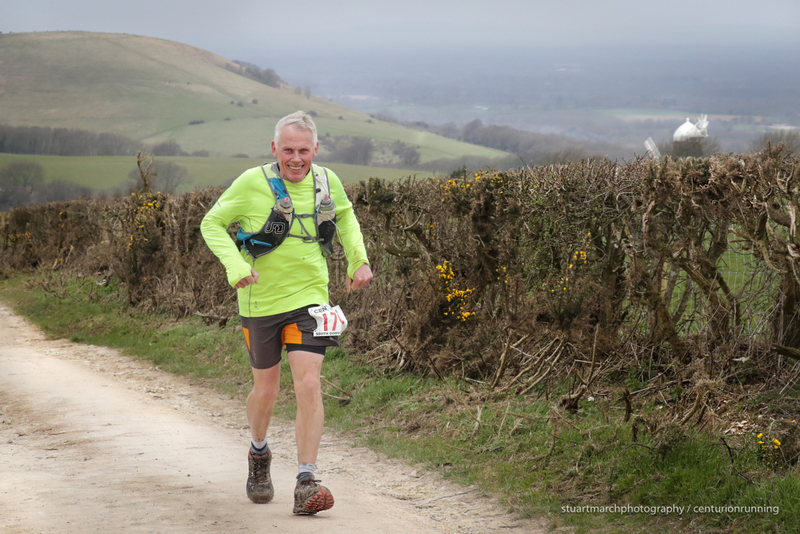 Across Firle Beacon his stride was as strong as ever and on and down through Alfriston and Jevington in unbroken focus the only question was how far under 6 hours was he going to run. In the end he cruised around the track and finished with his trademark salute (Tom has served in the British Army for many years) in a time of 5:44, making a huge 9 minute dent in the existing course record. It was close to a flawless performance and truly sensational to watch. He moves on to the Worlds with authority. In the womens race, Sarah Morwood dominated in the same fashion albeit with a narrower cushion over some of the other leading ladies in the field earlier on, before stretching away and showing true class in the closing stages. Through Botolphs in 1:32 Sarah had a two minute lead over second, but that lead had become 13 minutes by Housedean the 'half way' check point, only for Sarah to finish up with a staggering 47 minute margin of victory by the finish. It takes great patience to go out at a conservatively enough effort to run the same pace for the last miles as the first, but that is exactly what Sarah did. From being 20th at the first check point, she passed everyone in the field apart from our top two men, to finish third overall. Her course record of 7:03 was thoroughly deserved. In 2013 Sarah went off course at this event and ended up on Eastbourne sea front in what was her first major ultra. She has subsequently gone on to win this event twice, the SDW100 twice, the A100/ W100 twice and the TP100 - in her eight Centurion starts. Quite an incredible record. Behind Tom in the mens race, Alistair Palmer ran strong and determined all day, coming home in 6:53 for the only other sub 7 hour time of the day. Third place went to Tomasso Migliuolo in 7:09, converting his impressive mountain running resume to a flatter faster course. Second place in the womens race went to Annabelle Stearns another incredibly consitent performer in our events. 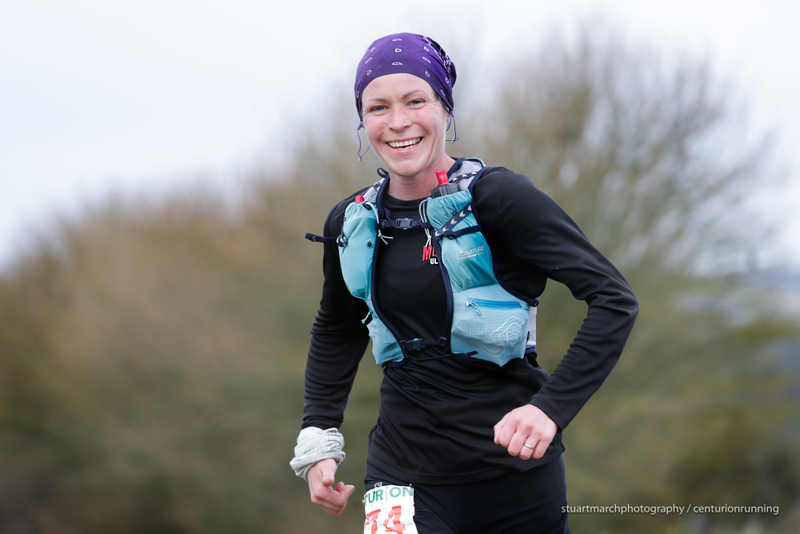 She passed eventual third placed finisher Christine Howard soon after the Southease check point and the two battled hard all the way to the finish, both coming in under the 8 hour mark in 7:50 and 7:59 respectively. It was fantastic to see such competitive racing. Down the field there were rafts of PBs and relatively few drops, amongst some extremely impressive age group performances. 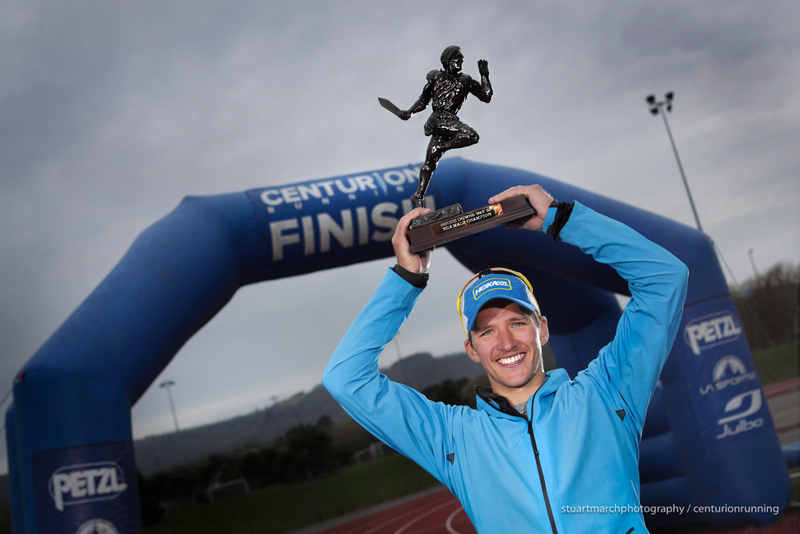 Of particular note in the V50 category, Rick Curtis bettered his own record and ran 7:22. In the V60 mens category, Timothy Boone ran a superb 8:41 and we had a new V70 record from Richie Morrissey. 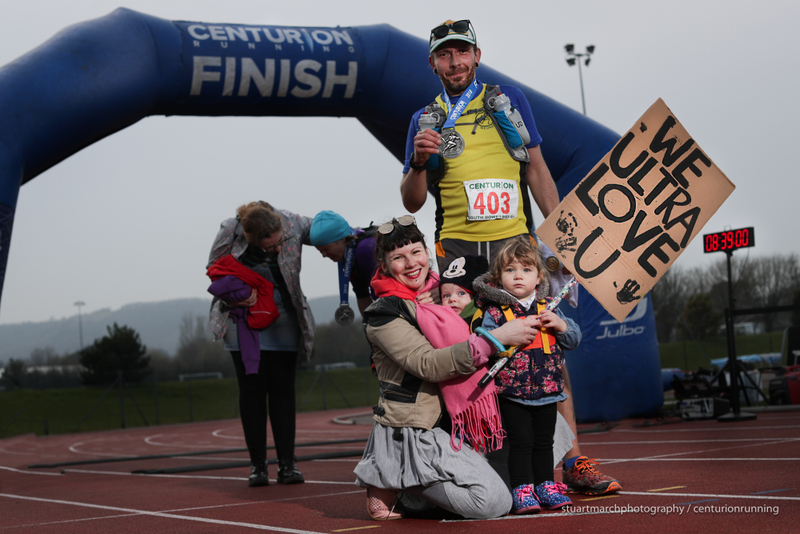 Richie was our second to final finisher at the inaugural SDW100. Last year he ran this event in 12:00 and this year came back and set a new best of 11:49. Annabelle Stearns was just outside her own V40 womens record and the V50 age female age cat went to Samantha Ridley. All in all 353 runners crossed the line down eleven year on year (there were four less starters this year than last), a tremendous day on these beautiful trails that we are privleged to be able to race on. A huge thanks to the 80 marshal's out on course enabling the race to be the safe and successful one that it was. We welcome 300 starters to the Thames Path 100 next month on May 5th so join us again then via the live link on the homepage to follow online.